A Wood Burning Fire Pit or Wood Burning Fire Pit Table can turn your backyard living space into a warmer and more cozy outdoor entertainment area. While it’s true a wood burning fire pit or fire pit table are inherently not quite as safe as Propane Gas Fire Pit Tables, with the right construction, materials and spark arresting steel mesh screens, wood burning fire pits can be near as safe as Gas Fire Pits and still satisfy the yearning for that smoky odor, burning embers and wood crackling as it burns. Is a Wood-Burning Fire Pit Right for Your San Diego Home? For the ECO-Conscious, as long as you’re using your fire pit in moderation, your carbon footprint will not be excessive. 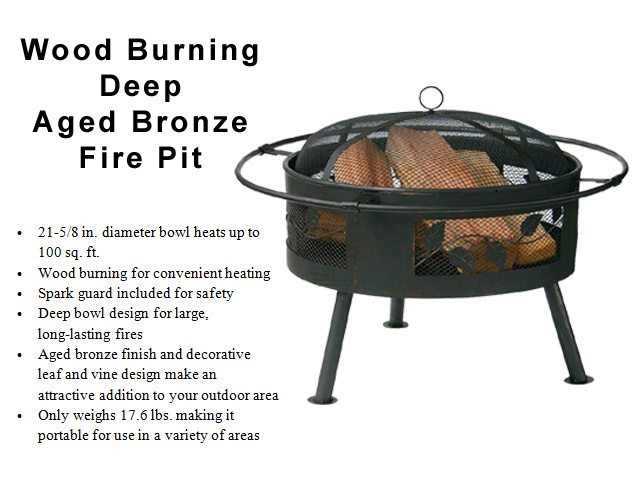 With a wood burning fire pit, the restrictions of gas lines or outlets are not even a factor. Have a good Class A rating fire extinguisher handy in case of emergency. Make sure all adults and teenagers know where the fire extinguisher is and how to use it. Don’t allow any combustible materials to be within 10 feet of your Fire Pit – That magazine rack next to your lounge chair is a NO NO! Use a Spark Arrester Guard made of steel screen mesh to cover your fire pit at all times. Wood Deck Placement and Protecting Your Deck – Metal Wood Burning Fire Pits naturally conduct heat towards the closest surface. The head from your fire pit will discolor your deck wood. If you must place it on your wood deck, be sure to have a heat shield pad on your deck beneath your fire pit.